Congratulations to "Erin F.", the winner in Karen's giveaway. Thank you to all who participated! A great word, isn’t it—together? Did you ever stop to ask yourself why there is a subgenre of romance (or is it a subgenre of suspense?) called ROMANTIC SUSPENSE? And why this website with the clever name JUST ROMANTIC SUSPENSE? Why publishers label books that way? It’s what it says on the spine of my novels. As an author who has written in both categories for about 30 years, I think I know. There is a lot of suspense in any romance (will they fall in love/won’t they/what can go wrong) and a lot of romance in suspense. It just doesn’t work well to have a straight suspense without someone in danger who needs help, or a team working well together, or a rescue of one person by another. In other words togetherness, usually between the hero and heroine. Anyone who has ever been in love knows that trusting someone else—an outsider—is risky business. We are emotionally vulnerable beings; we need each other, but we can be deeply hurt and even damaged if something goes wrong. In each of the books in my COLD CREEK TRILOGY, I hope the reader is holding her breath not only to see how the hero and heroine can find enough trust to work together, but to be honest enough to solve their problem, which is deadly danger that threatens them both. In BROKEN BONDS when Char Lockwood sees a car with a man trapped inside dangling over a cliff, however great the danger to her, she tries to help him. He later teases her about if you save someone’s life, you are responsible for that person, but she begins to feel that way. Char and Matt Rowan are as different as they can be. He’s well-to-do, she’s a social worker among Appalachian children. He’s a “company man”; she’s so independent she’s almost careless about it. Yet, between them, lightning strikes, and when Matt’s life is threatened again, Char is all in to help. So the thriller elements of the book and the love story entwine grow from there. So writing romantic suspense is a balancing act: keep the action going both in developing the romance and in the dangerous, unknown of what’s coming next to threaten the lives of those falling in love. As my agent has said more than once, “Every good main character loves someone and has a secret.” Hm, maybe I’d better let my characters take over my next book again. They are pretty good at writing their own romantic suspense stories. But that’s a whole new topic for another time: Should an author let her characters take over the story or make them toe the planned-ahead plot line? Stay tuned. 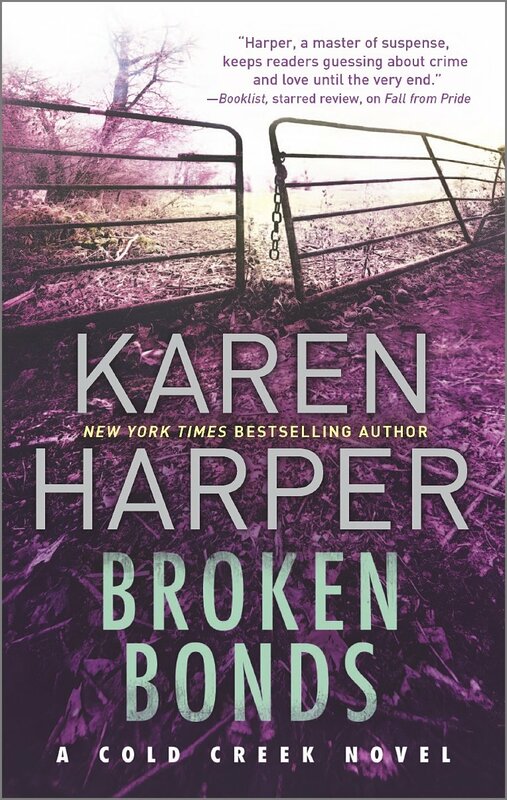 Karen will be giving away a signed copy of BROKEN BONDS to one lucky person leaving a comment or email entry. 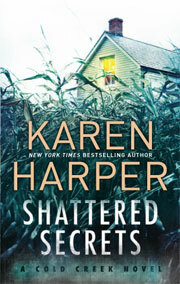 Karen Harper is the NYTimes bestselling author of romantic suspense and historical fiction. SHATTERED SECRETS, book one in THE COLD CREEK TRILOGY was voted as one of Suspense Magazine’s Best of 2014 books. Winner of the Mary Higgins Clark Award, Karen and her husband divide their time between Ohio and Florida. Giveaway ends 11:59pm EST February 1st. Please supply your email in the post. You may use spaces or full text for security. (ex. jsmith at gmail dot com) If you do not wish to supply your email, or have trouble posting, please email maureen@justromanticsuspense.com with a subject title of JRS GIVEAWAY to be entered in the current giveaway. US residents only. I agree that romance and suspense go together. I think the romance gives hope when the suspense becomes scary. I've read a lot of authors that have said the characters just take over & tell the story. To have the ability to be a writer must be awesome! Thanks for sharing! Hi to JRS Readers! I'm excited to be the guest blogger today on this great website. If you read e-books, head on over to Book Bub today (Sat. 31st; last day) where you can buy SHATTERED SECRETS for $1.99. Also, I'm doing a live event today that is quite unique. A local furniture store has decorated a room for each of 10 authors where we'll be signing books. I'll let you know how it goes. Also, please drop by my fairly new facebook page at www.facebook.com/KarenHarperAuthor. Have a great day! It is so important to have an uplifting ending in rom/sus. I'm one of many judges for the Romance Writers of America contest this year and one of the requirements for judging is that the book must have a "resolution of the romance that is satisfying and optimistic." That means if they aren't totally committing at the end of the book, we are very sure they will soon be. Both the hero and heroine have grown and changed as they have fallen in love. When writing a trilogy of series, the author can spill the total commitment part into the next book--or does that frustrate readers? Already have Shattered Secrets on my kindle. I don't like cliffhangers but do not mind if the relationship carries over in the next book especially if it is a secondary character or as long as the relationship doesn't end in a cliffhanger either. I know it's time to actually start writing a book when I "hear" the hero/heroine start talking to each other--full blown scenes. Sometimes ones from early in the book sometimes not. Call me crazy, but it works! I have to say that I love the excerpt of this book. You are a new author to me and I love what I'm reading here about your books. I enjoy suspence romances so much. And your agent has a point ;) Thank you. You're so right. Romance and suspense go together well. Intense relationships form during intense situations. In real life they may not extend past the resolution, but a good author turns it into Happily Ever After. Thanks, Becky! Always good to hear from you and since I love your books, the compliment means a lot! Okay - Google is giving me trouble so please excuse this if its a repost. Like Becky, I completely loved BROKEN VOWS but I wanted to stop by and say hi. Oh this series sounds good... I have to make note of it! Thanks for sharing! Wonderful post! I have really wanted to read your books. I love romantic suspense!! This book sounds awesome and I've put it on the wish list.. Thanks for the chance. Congrats to Karen on her trilogy!!! This sounds fantastic :) I totally agree that suspense and romance go hand in hand. I don't know why but I totally fall in a romance when there's suspense involved. I hardly ever find myself falling out of the story and questioning the romance components. I don't know, maybe b/c when there's no tension or conflict, I don't really buy into an instalove/instaconnection. But if they are being chased or stalked, bingo! It totally makes sense. I definitely have to check out this trilogy. Thanks for sharing! Good, analysis, Erin. My feelings exactly. Even the books where there are a lot of personality/family/career/bad background problems for the couple seem tame to me compared to rom/sus--and, oh yes, hang together and help each other out or you could be killed. As Mary Higgins Clark put it once, it ups the ante. I agree completely, romance and suspense go hand in hand very well. I like how they build on each other and lead excitement and twists and turns to the characters and story. I hope to make another drop-by today, but, as most Americans know, it's SuperBowl Sunday and we have some things going on. My husband is such a great support to me--career-wise, he proofreads and acts as my business manager--that I need to get in on his interests too. And, thank heavens, I do like football! So, just want to thank all of you who have commented and anyone else who may drop in. And especially to Maureen for this excellent, focused and ever-fresh website. Rah, rah, romantic suspense readers and writers!